The clock was erected to commemorate those who died in service or were killed in action during World War One. The words "Lest We Forget" replace the usual clock numbers. BANGALOW, Friday. 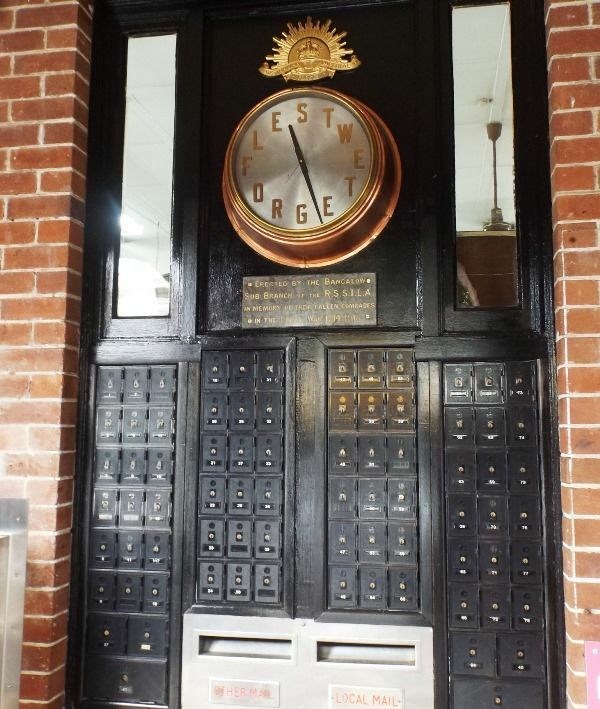 Bangalow branch of the Returned Soldiers' League decided that the sub branch's veteran secretary (Mr. W. H. Reading) officially unveil the "Lest We Forget" memorial clock at Bangalow post-office next Sunday, which is Anzac Day. The ceremony will follow the Anzac Day united service, which will commence at 11 a.m.
Northern Star (Lismore, NSW), 24 April 1937. 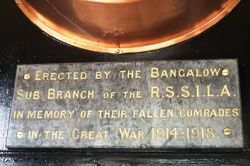 A simple and dignified ceremony was held at the Bangalow Post Office to unveil the memorial clock.The clock was erected by the members of the Bangalow branch of the Returned Soldiers' League in memory of fallen comrades. In place of numerals to mark the hour, the words "Lest We Forget," are placed around the dial. The case of the clock is of one piece spun copper, 25 inches across the base. The dial is of burnished aluminium with raised metal block letters. Above the clock is a 15in. bronze replica of the "Rising Sun" badge of the Australian Imperial Forces and underneath is a polished black marble tablet with letters of gold. The whole is on a polished panel of walnut. The clock was purchased from Mr. Crisford, the marble tablet was donated by Beckinsale and Co. and the polished walnut is the work of Snow's. Mr. G. Sketchley (president of the Bangalow branch) had charge of the large gathering at the post office, the crowd numbering about 700. Mr. G. Crisford spoke on behalf, of the trustees and explained how the money had been raised many years ago for the purpose of assisting necessitous war widows and to erect a suitable memorial. 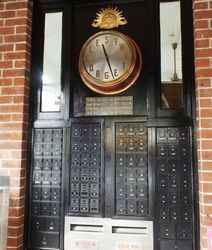 He said that although the clock was being given to the people, yet, to conform to an agreement with the Postmaster-General's Department, the ownership of the memorial would be in the name of the trustees of the Bangalow branch of the League. Mr. W. H. Reading ( veteran of wars of last century and also the secretary of the Bangalow branch) unveiled the clock. Northern Star (Lismore, NSW), 29 April 1937. Erected by the Bangalow Sub-Branch of the R.S.S.I.L.A.